The Anchor Line's second California, this ship was built by D. & W. Henderson, at Glasgow. Launched in July 1907, she entered service on Anchor's Glasgow-Moville-New York route on 10 October 1907. When World War I began in August 1914, California was aground on Tory Island; she had been there since 28 June and would not be refloated until 20 August. She was laid up for repairs until October 1915, when she resumed service on an Anchor/Cunard joint service from Glasgow to New York via Liverpool. 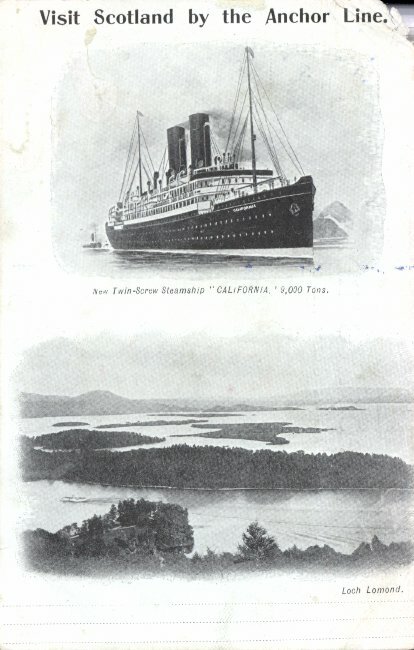 On 7 February, outbound from Glasgow, California was torpedoed and sunk about 40 miles southwest of Ireland. She sank within minutes, and 43 of the 205 people on board perished.